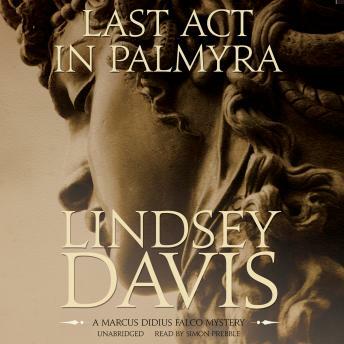 Last Act in Palmyra is the sixth book in the bestselling Falco series by Lindsey Davis. The spirit of adventure calls Marcus Didius Falco on a new spying mission for Emperor Vespasian to the untamed East. He picks up extra fees from his old friend Thalia the snake dancer as he searches for Sophrona, her lost water organist. With the chief spy Anacrites paying his fare, Falco knows anything can go wrong. A dangerous brush with the brother, the sinister ruler of Nabataean Petra, sends Falco and his girlfriend Helena on a hasty camel ride to Syria. They join a traveling theater group, which keeps losing members in non-accidental drownings. The bad acting and poor audiences are almost as bad as the desert and its scorpions-then as the killer hovers, Falco tries to write a play. This is a good book with several plot twists and unexpected results. The narration is actually good. I generally have liked this narrator's reading of the Falco series. The recording on this book, however, has some editing issues. There were many places where sections of the narration were repeated. It would reach the end of a sentence and then suddenly jump back a few minutes and repeat it. I checked and it wasn't my app as the time continued counting forward continuously. It wasn't so bad that I would recommend against listening, but it was an annoyance that Audiobooks should correct.